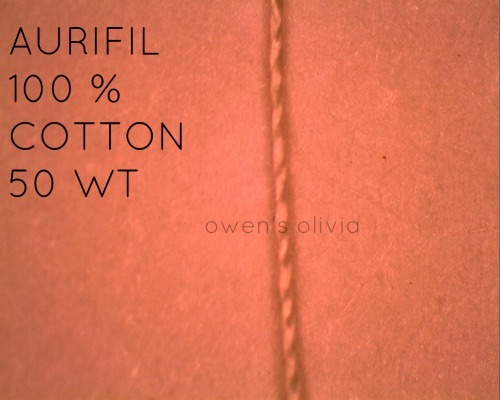 I’ve been hearing rave reviews about how wonderful Aurifil 100% cotton thread is for piecing, so that was a no brainer. But after finishing my latest quilt, I can now recommend it for machine quilting, too. Here’s a closeup of one of my String of Pearls blocks, quilted with matching Aurifil 50wt cotton. I like the 50 weight because it works well for both piecing and quilting. I prefer to buy the larger 1300 meter spools because that’s usually enough thread for an average sized quilt. 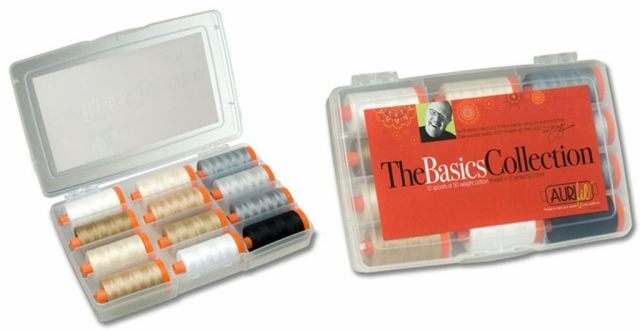 Since it can be kind of spendy to stock up on large spools of all the colors I need, being able to use the same thread for sewing and quilting makes it more economical to keep a wide variety of colors on hand. I love all the neutral basics, too! 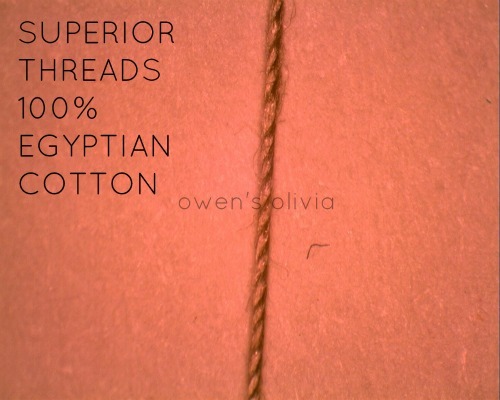 Thanks to Nancy at Owen’s Olivia for her indepth thread review, I was able to see exactly why Aurifil is such a good quality thread. Her husband took these pictures under a microscope showing what thread looks like when magnified close up. I’m re-posting them here with her permission. Aurifil is very smooth and closely twisted, leaving less lint and making for a nice tight stitch. 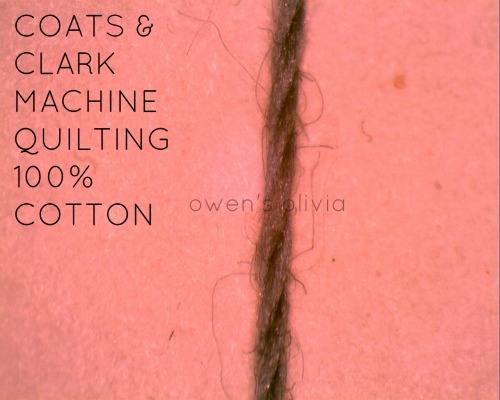 No wonder the cheaper cotton threads are so linty – just look at all of those thread slubs sticking out everywhere on the last picture! 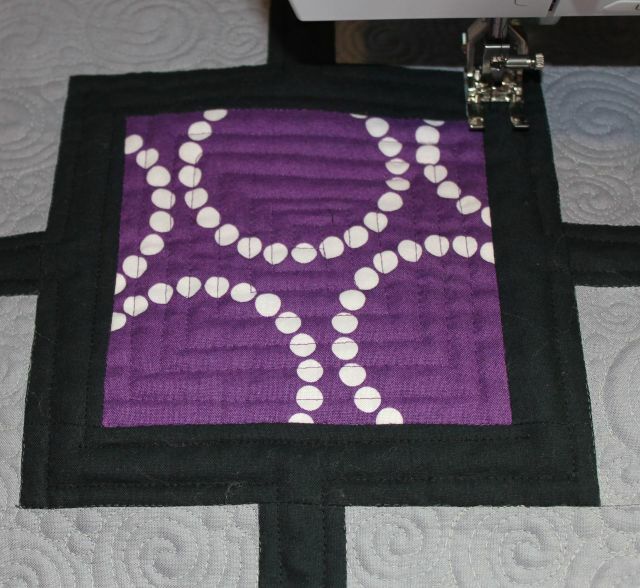 My top two machine quilting tips are to use a thread that blends with your fabric, and use the same thread in the top and bobbin. Both of these suggestions will help hide your mistakes (not that anyone makes those, right?). In all fairness, I do like other brands, too (Superior So Fine 50 wt Polyester, Glide and Isacord Polyester, and Superior Silk.) But Aurifil will be my new “baseline” or go-to thread for both piecing and quilting from now on. Were these all the same weight for comparison? did they use the recommended needle size? Just wondering…. Christa, I know I commented on this when you first did this blog entry… When you machine quilt, or piece your quilt top do you use the same 50wt on the top and bobbin thread? Thanks. I have been hoarding fabric for a while now I am ready to load up on thread. I saw your link. For the thread on your amazon site. By the way… I love it when I get my fabric orders in from your shop… Love the way the fabric is individually wrapped. Makes it like lots of little presents. Thanks! Thanks for your nice comments! Yes, I try to use the same Aurifil in both top and bobbin – 50 weight. I like to try all kinds of different thread also and thanks for the info on Aurifil thread Christa, I need to try some! Thanks for sharing. Never used the stuff. But keep hearing good reviews. Love Aurifil- I use it like you do, as a baseline, but am willing to use other threads. After all, it’s quilting, not brain surgery, no one’s going to die if you break some rules here and there! Can you get us a photo of Connecting threads thread? It would be a great comparison. I just started using Auriful also! You are so right, it is wonderful. It makes a great difference with the lint in my machine. Thank you so very much for this post! Aurifil is my favorite for piecing indeed. I get a little nervous when I dont have an extra of my “go to” neutrals lying around! Thanks for sharing Christy! I currently use Aurifil in my bobbin and Guttermann for my top thread. My Bernina loves the combo! I really like how flat my seams are when I use Aurifil. Great company! I have used Aurifil thread for some projects and I also find it very good. Thanks for the explanation. I have been using up my other threads and I can tell the difference. Wonderfil, a Canadian thread is also good. They have a line called invisafil that was recommended to me at an applique class. I didn’t even know about Aurifil until I won a box of the Flats collection in a giveaway in the spring. It really does make a difference. I’m gradually adding to my small collection and feel even more justified in the spending the extra money when I see reviews like this from more experienced quilters, so thanks for posting! 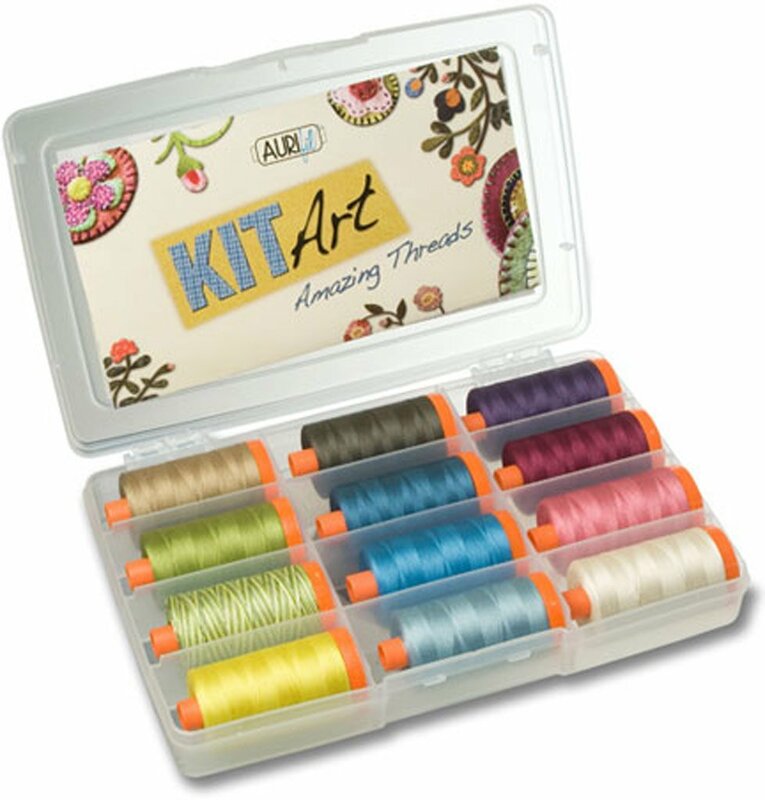 Are you going to carry Aurifil thread in your shop? Thanks for the info and the pictures are truly eye opening. Thanks for this review. I have been using Coats and Clark for everything only because Wal Mart is the only shopping place around here. I went to KC last weekend and bought my new FOREVER sewing/quilting machine and I got 30 spools of Madeira thread. I am looking forward to trying them too. (And looking forward to unpacking my machine tomorrow… I wanted to rearrange my sewing room first before I got her out.). Did you ever name your new Bernina?